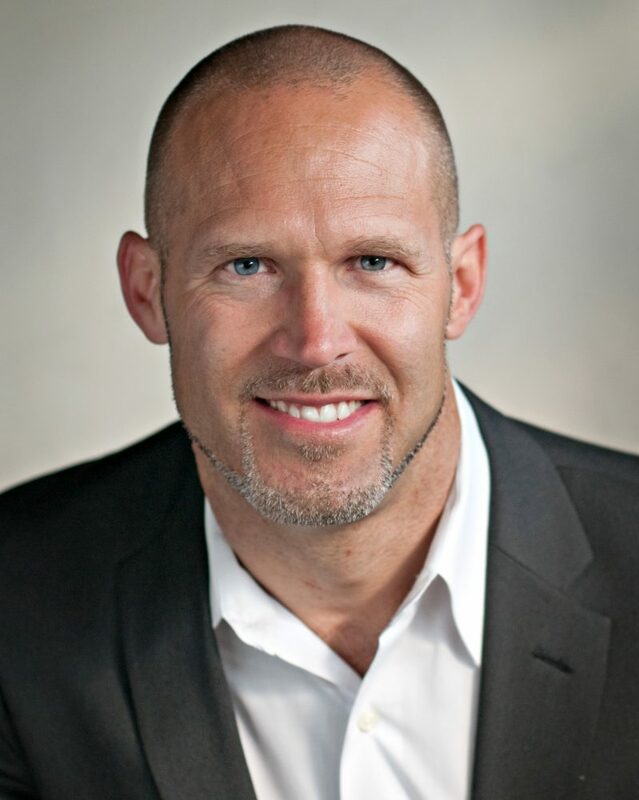 Paul Koch, former Husker Power strength & conditioning coach (1987-1995), hails from Petersburg, NE and resides in Southern California. A lifelong fan, failed walk-on candidate & eventual staffer, his unique perspective of Nebraska Football comes from experiences of that greatest era. A 1991 graduate of the University of Nebraska with a BS in Education with an emphasis in Exercise Science, he’s contributed to various journals and collected pieces, enjoys time with family & crushing low-stakes Texas Hold ‘em Poker when not cheering & fretting his treasured Huskers. This series contains excerpts from his work titled “No Place Like Nebraska: Anatomy of an Era” Volumes 1 & 2, a collection of intimate one-on-one conversations with key figures of the 1990s championship era involving numerous coaches, players, staffers, beat-writers and even a few fans. Inspired by the best-selling research tome “Good to Great” by James C. Collins, each conversation builds upon another to reveal a unique perspective, weaving together the fabric of that time with crucial details about a culture of excellence and an oftentimes life-altering student-athlete experience. Books available on Amazon.com. 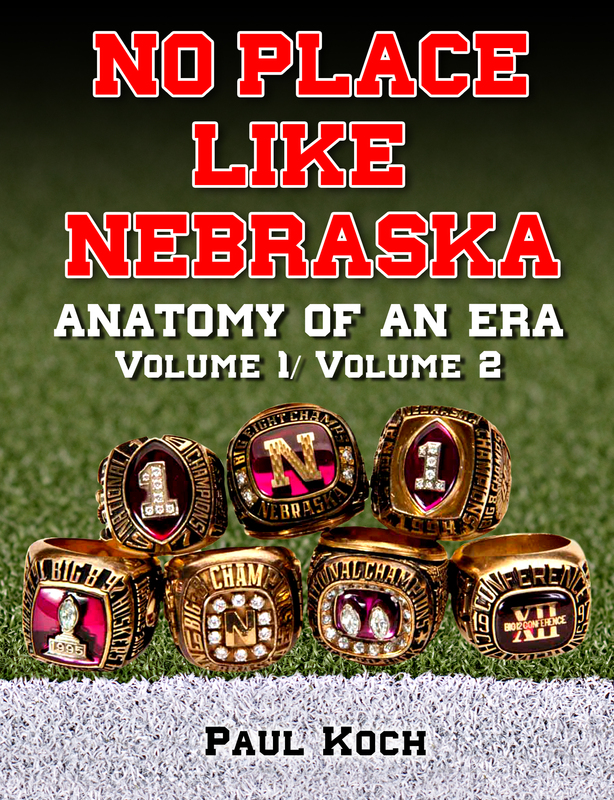 “No Place Like Nebraska: Anatomy of an Era” Volumes 1 & 2 is a highly relevant, engrossing, in-depth and authoritative chronicle of Nebraska football. Written by native son Paul Koch, it’s a must-read. Wildly entertaining, thoroughly informative and refreshingly honest, this effort pulls back the curtain to reveal the personalities, culture and process behind the 1993-1997 Nebraska Cornhusker Football squads, with the 1995 team frequently voted the greatest in all of college football. A voluminous revelation of heartfelt, behind-the-scenes vignettes and anecdotes from the heroes, visionaries & rogues of that era, this insider’s all-access investigation is equal parts The Boys of Summer (Roger Kahn), Good to Great (Jim Collins), Ball Four (Jim Bouton) and Brian’s Song (William Blinn). A must-have for any personal library, this magnum opus of biblical proportions is a chronicle of the late 20th century University of Nebraska locker room scene you simply can’t put down. No book has ever before celebrated the people, the history, the geography, and the preeminent sport of the state of Nebraska’s affection quite like this. Tying together the accomplishments of its greatest citizens past & present, its unique climate & culture, and a hardiness and rugged individualism passed down from its founding pioneers, it’s a mosaic of a region told through the prism of a venerated college football program at its all-time peak. Simultaneously paying homage to the participants while also exposing them as fallible (and sometimes foul) creatures, it’s a realistic revealing of a time before football ‘turned soft’. It lays out the true underpinnings of success and the leadership qualities necessary for sustained excellence. Told by an insider (Univ. 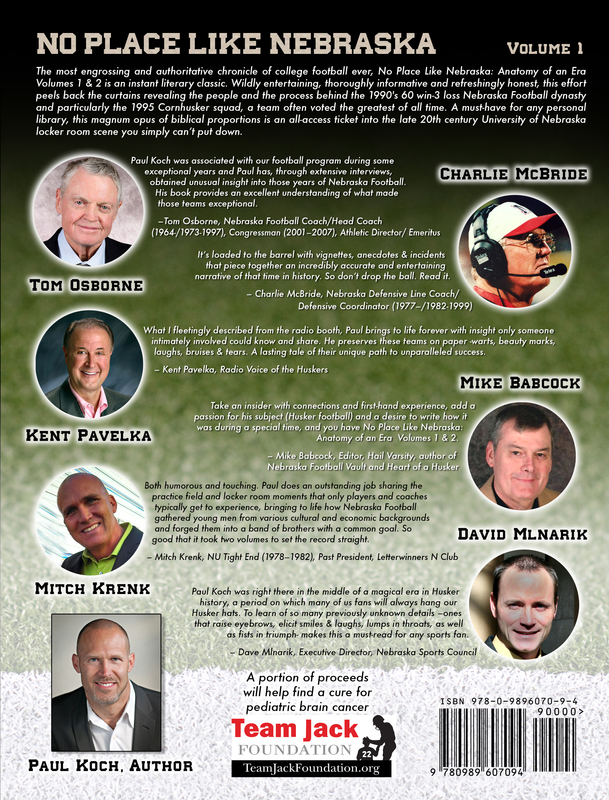 of Nebraska Strength & Conditioning Coach, 1987-1995) enjoined in frank and open discussion –good, bad, and ugly- about the culture, motivations and personalities of that time, the content focuses on the heroes and villains of the day and reveals previously untold insights about Coach Tom Osborne’s campus juggernaut like never before. Football fans looking for a glimpse into the glory years of one of college football’s all-time winningest teams during its greatest era will find insights galore. Anyone interested in organizational leadership and the methods & tools to achieving sustained success will walk away enlightened.